It's a shame that Ghost Rider doesn't look like this. The new Crogan Adventures radio drama is now available for your listening pleasure! You can listen online, download it, or find it via iTunes thanks to Decoder Ring Theatre! With additional voices by Robert Westgate, Hans Messersmith, and Ryan Sero. And me. The show was directed by Gregg Taylor. He recently wrote a great comic series called Mask of the Red Panda, which is available digitally from Comixology for only 99 cents per 35-page issue. That's three bucks for a full story! You can check it out here! A lot of the designs for the Crogan family have changed somewhat. Sometimes this is a result of learning who the characters' moms are, sometimes it's finding their personalities as I do the research. Either way, I figure it's time to do a full revision. 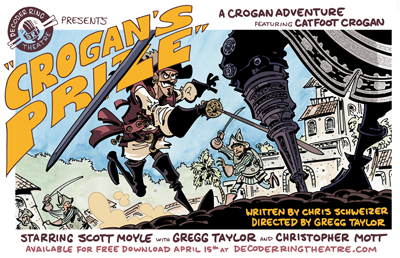 In just a couple of weeks, the second Crogan Adventures radio episode from Decoder Ring Theatre will air, featuring the return of Catfoot Crogan! 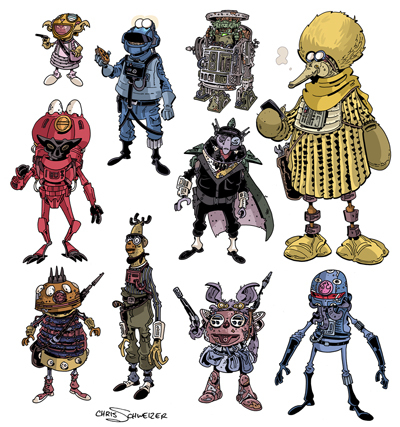 In the meantime, here's a paper figure set featuring a few of the characters from the show! p.s. Bear with me if the link behaves differently from previously posted sets. I'm working to transition everything away from my SCAD web space, which I previously used to host files. Oh, my! The first episode of the Crogan Adventures Radio Shows went up and I forgot to blog about it! My apologies. Between school and projects, some things slip my mind. Here it is... 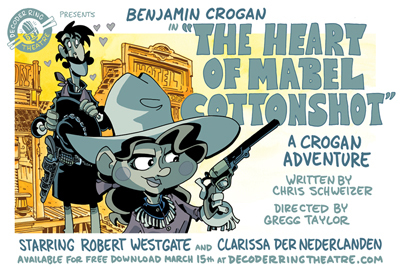 The Heart of Mabel Cottonshot! with additional voices by Ryan Sero and, well, me. That's right! They were nice enough to let me do a few voices. In this one, I play a few of the customers in the bar scene from just after the commercial in the middle. The modern Crogan family starred Michael Booth as the dad (whose first name is revealed in episode 2, I think), Hero Van Harten as Eric, and Shannon Arnold as Cory. The show was directed by Gregg Taylor, who did a darn fine job of things as he always does. It's free to download, and it's free to listen to it online! You can also subscribe to Decoder Ring Theatre in iTunes. get listenin'! 1. I'm not tabling this year, given that it's my first time out and I want to get a feel for the show. If you want to find me, however, I'll be using my dear friends Jackie Lewis and Erin Gladstone as my home base. Even if I'm not hanging out at their table, they'll know where to find me, so check there. It's table E-13! 2. I do have some set signing times at the Oni booth! I'll be singing Saturday from 1pm-2:45pm, and I'll be signing Sunday from 10am-11:45am. And if you buy a Crogan book at the Oni table and want me to draw a picture in it for you, anyone there should be able to track me down, too! It's only fifteen days until the release of the first Crogan Adventures Radio Drama, "THE HEART OF MABEL COTTONSHOT!" I figured I'd post up the paper figure sets for these episodes ahead of time, so that if you want to print out and assemble the figures so that you can play out the episode as you listen to it you'd have that option. There are six figures for this set. Keep your eyes peeled for announcements about the radio shows, coming in two weeks, or very near thereabout. Click the image to download the file! With some browsers, you may need to right click and choose "save link as." I figured I'd try my hand at doing some video and audio blogs. Here's a quick watercolor demo. NEW, CRAZY LOW PRICES ON COMMISSIONS! Usually when I post commissions for my regular shows, they go pretty fast. Not so with my recently announced Emerald City ones. I'm chalking that up to this being a new show, and that I may not have a lot of readers in the Pacific Northwest yet (which is a big reason why I'm doing the show this year). Either way, the market has clearly dictated that, at the prices I listed (which I was considering low) there aren't a whole lot of bites. Not as many as I'd like, anyway, which is to have to cut off the valve and point out that my commission list is full. So what am I doing? I'm dropping prices! Don't worry - those who have already bought commissions have ALREADY received a refund to make the price that they're paying the same as the ones offered now (plus an extra buck as a negligible but visible thanks for being an early orderer), so check your paypal account. For new folks, these prices are crazy! 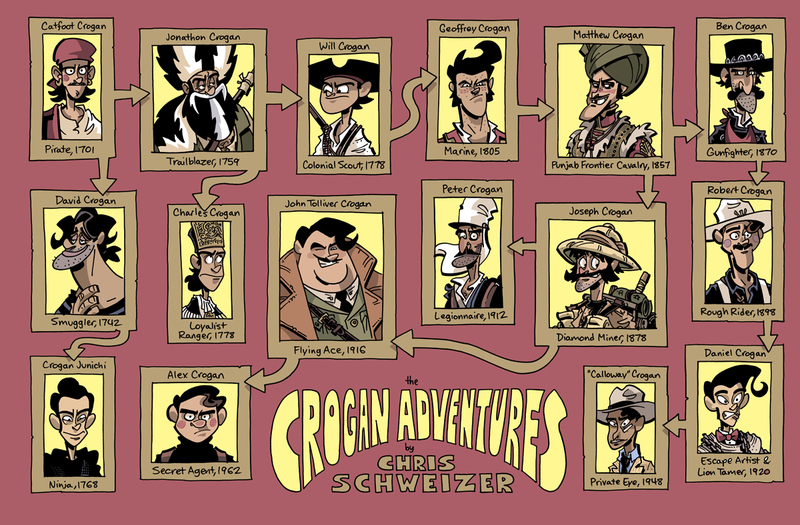 The last option on the scroll-down order bar is a real kicker - you can get a set of THE ENTIRE CROGAN FAMILY TREE, all of the characters on the books' endpapers, for $200. That's SIXTEEN WATERCOLORS, 5x7" each and suitable for framing. 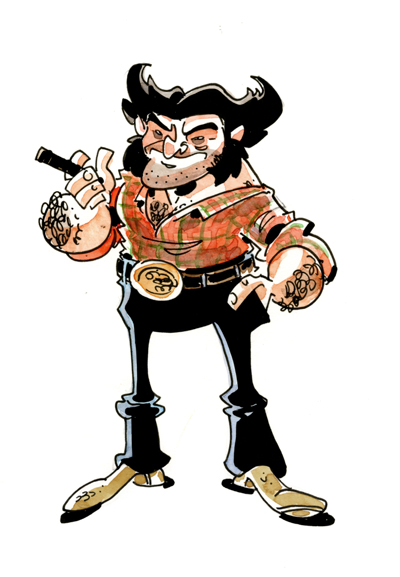 And unlike the other commissions which are only available to Emerald City Comic Con attendees, this one is ALSO available to ANY AGENT OF THE CROGAN ADVENTURE SOCIETY. 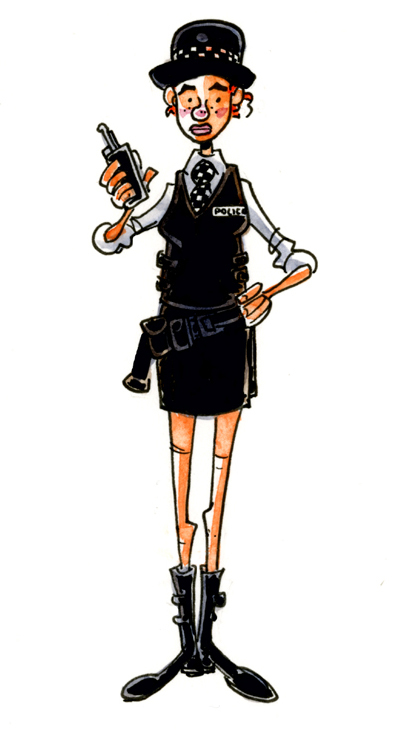 So if you have a membership, you can commission one of these sets, too. If you're outside the US, please add ten bucks for shipping. US residents, free shipping! I don't know if I'll be offering this set after EMCC. There's a chance I might, but it'll depend entirely on scheduling, so if you're seriously interested, get it in the next two weeks! When I'm not doodling history, I'm doodling Star Wars. And I figured it might be fun to occasionally try Star Warsin' some other franchises, and see if I can make them look like they belong in the SW universe. 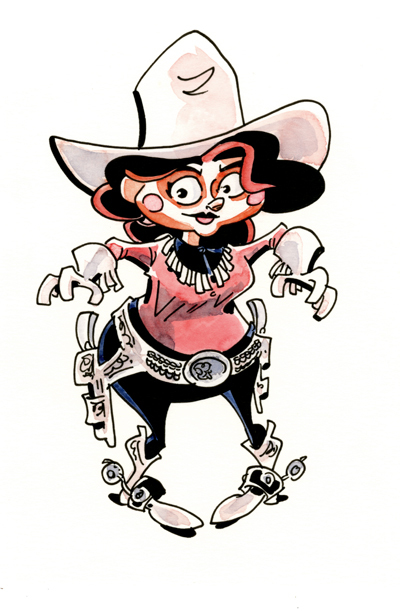 Going to EMERALD CITY COMIC CON, and taking commissions! Well, I didn't think I'd be able to make it this year, but it turns out I was wrong. I'll be going to Emerald City Comic Con in Seattle, Washington this year, from March 1-3. Aside from San Diego Comic Con, I've never been to a west coast show (actually, I don't think I've ever done another show west of Texas! ), so I'm excited about the chance to meet lots of new friends, readers, and art collectors from the other side of this great land of ours. I'll be signing books at the Oni Press booth throughout the show (signing times will be posted as soon as I've got 'em) and I'm also taking commissions in advance! I'll take some at the show, but as I won't have a table of my own I'll be very limited in how many I'll be able to take on. So, if you want one (or more), the best way to do get it is to do so ahead of time! 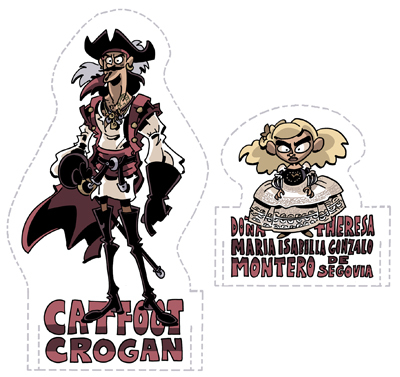 CROGAN ADVENTURES characters are only TWENTY ($20) BUCKS APIECE! Sound good? Let me make it better. Five (5) Drawings: $100! That's a savings of $25! 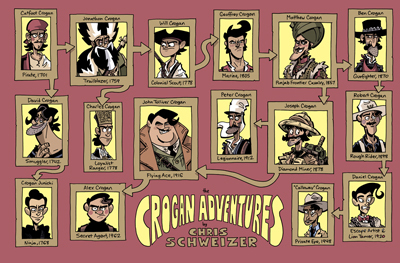 Six (6) drawings of Crogan Adventures characters: $100! That's a savings of $20! In case you're unfamiliar with how con commissions work, I want to note that these pieces WILL NOT BE MAILED. They are for pickup only at the convention. Commissions that are mailed tend to cost a bit more, because mailing eats so much into my work time. I'll be moving soon and undertaking comics-making on much more frequent schedule, and such an endeavor naturally requires money, so ordering commissions of this sort always helps me out and makes it possible for me to amp up my output. Thanks, and see you in Seattle! I love to get scared around Halloween. For the month and a half leading up to it, I watch lots of scary movies, read scary books, etc. 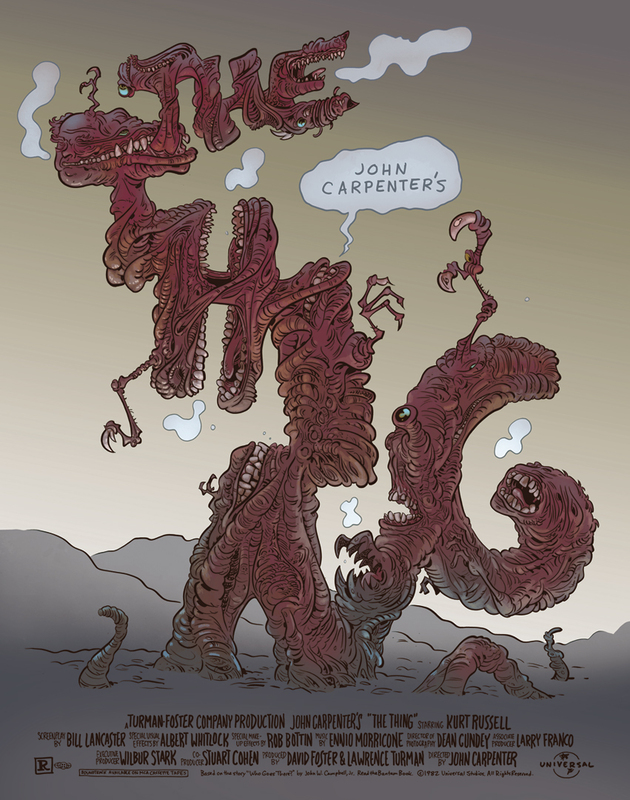 And one of my favorite scary movies is John Carpenter's 1982 paranoia/monster chiller THE THING. So I drew a poster for it. The poster was colored by Nolan Woodard, a colleague in the SEQA department at SCAD and who is responsible for, among other things, the colors for Mark Waid's THRILLBENT comics Check out his other stuff here! I drew this poster at poster size, actually. It's pretty gigantic. You can see the original/b&w in the STORE section. 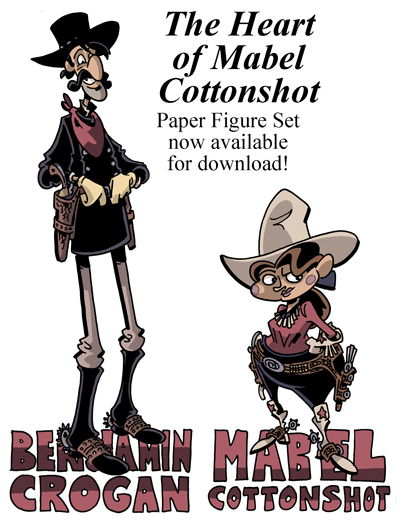 Some time ago, I posted a couple of paper figures of Brian Hurtt and Cullen Bunn, the writer and artist of the Sixth Gun (I would have drawn colorist Bill Crabtree, too, but we've never met and I don't know what he looks like!). Well, these were only two of a much larger batch of paper figures that I was intending to post weeks ago... and I got too busy to finish them. Well, I'm still busy, but they're all drawn, and I can spare the five-ten minutes it takes to color them if I only do one a day. So that's how I'm gonna do it. 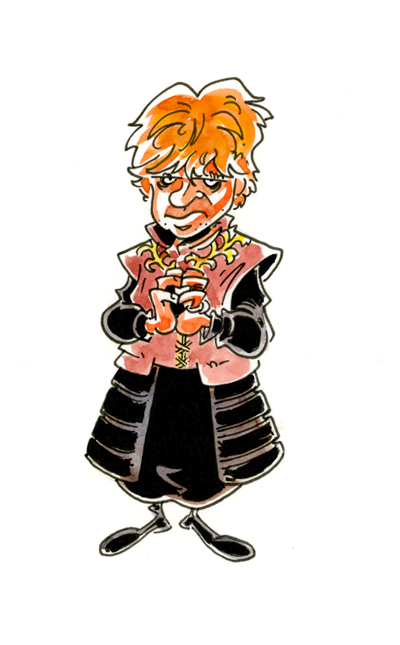 I'm not posting the print file until the whole thing is done, but I'll post up the drawings over the next week or so. 1. I only allowed myself to do people whose work I was a fan of before I ever met them. There are way too many people whose comics I've come to know through knowing them first, and I figured that it would be weird to draw some of my friends and not others (not to say that some of the ones I've drawn haven't become friends in recent years, and that those are friendships that I treasure, only that I was a fan of the ones I'm doing here before I had the chance to make any of their acquaintances). 2. I'm somewhat loose in my definition of cartoonist. Many of these folks are cartoonists, but some are writers or artists who rarely if ever dabble in the other field. I think that's it. Anyway, here's a couple to start you off. These guys are first up because, of this whole bunch, these are the ones with whose work I was first familiar, and who are in many ways responsible for me doing comics, at least in the way that I do them. Stan Sakai is the creator of the long-running (almost thirty years!!!) comics series Usagi Yojimbo, an epic story set in feudal Japan and using animals as its cast. I can never say enough good things about Usagi. 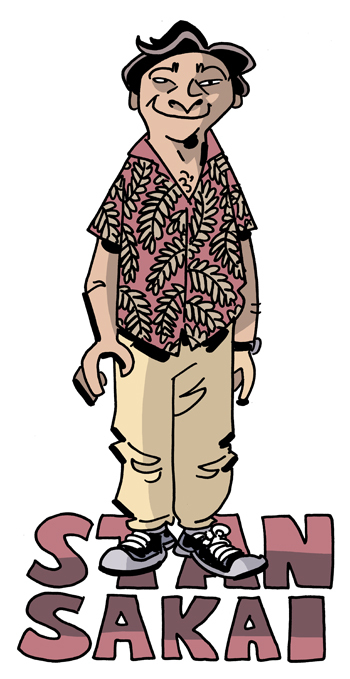 If you're interested, I had the good fortune to get to interview Stan as part of the Comics Journal's "Conversations" series a few years ago, and you can read it here. Currently, Stan is taking a break from Usagi to draw the story of the 47 Ronin. Jeff Smith is the creator of a few comics now, but the one that first grabbed my attention (and everyone else's was the comic/fantasy BONE. Jeff's aesthetic was a huge influence on me when I started out, and I still read and reread his work whenever I get the chance. He recently completed his second big creator-owned series RASL, a science-fiction noir story.